Fast and easy? Adaptable? Simple? Delicious? That’s this vegetarian pad thai. Here we are again, just me and my big bowl-o-noodles… and a few veggies, and a lot of sauce, and a handful of fresh basil and cilantro…. a fork, a hungry mouth, a heart-eyes emoji… ugh. This reunion with me and cooking could not get any happier. This Rainbow Vegetarian Pad Thai is first and foremost RAINBOW, which is the only fun way to eat anything in life. It is brown rice noodles (because we’re currently doing the sugar free experiment again and loosely avoiding refined grains) and spiralized veggies (because veggies in noodle form feels like more noodles) and a super tangy-delicious Pad Thai sauce that you just shake up in a jar in about five seconds flat, and peanuts that almost instantly start to soak up the sauce, and a gently scrambled egg that kind of cream-ifies the whole thing. Also: fresh herbs by the fistful. You’ll take a bite, you’ll love it, and then you’ll remember you have to add in the basil, and so you’ll add them in and try your second bite complete with the herbs, and OH MY GOODNESS things just went to the next level. I’m so excited for you. This Rainbow Vegetarian Pad Thai (with peanuts and basil dohhh) is just really good, my friends. It is really good and surprisingly easy. I took a few ideas I had seen out there in the big wide internet world (vegetables as noodles! Pad Thai sauce-ery!) and made them into this. And I am so happy with how it turned out + the minuscule amount of effort it takes to get there. What’s that now? Make something requiring more than three seconds of brain energy during the Crazy Days with our three littles? Sweet friends. You overestimate. As I’ve mentioned a few times, I’ve been really taking it easy lately in the kitchen. When I say take it easy, I don’t mean making ten minute basil artichoke toasts and five minute magic green sauce. I mean taking it easy as in NOT COOKING ANYTHING. We’re talking life-saving dinner made by friends, hot dogs (gulp), mac and cheese, and chicken nuggets out of the freezer. During these last few weeks, my old self has definitely been food-snob-judging my current self. If nothing else, this experience has shown me that my ideals for cooking and feeding kids have some work to do in terms of aligning themselves with reality. Reality = I’m tired and I haven’t had a ton of energy or appetite for cooking. Reality = I want to marry the person who invented applesauce in pouches. Reality = We’re getting the hang of it. It’s getting better. The kids ate REAL apples last week (coated with sugar and cinnamon and dipped in ketchup and hot sauce but whateverrrrr). We have the kids for a few more days this week before they go back to their family, and I honestly thought I wouldn’t see the inside of a kitchen for the rest of the time that they were with us, but somehow, during these last few days, I’ve army-crawled my way back into the kitchen to fight something delicious into existence which feels like a major personal and professional win. I even found it in me to eat this Rainbow Vegetarian Pad Thai for dinner the other night while feeding the kids some leftover pizza and apples. YES I KNOW. I rose to that level of Adult Eating Adult Food. It’s a hard job, all this noodle-eating, but I’m willing to fight the good fight. Carry on, Warrior! 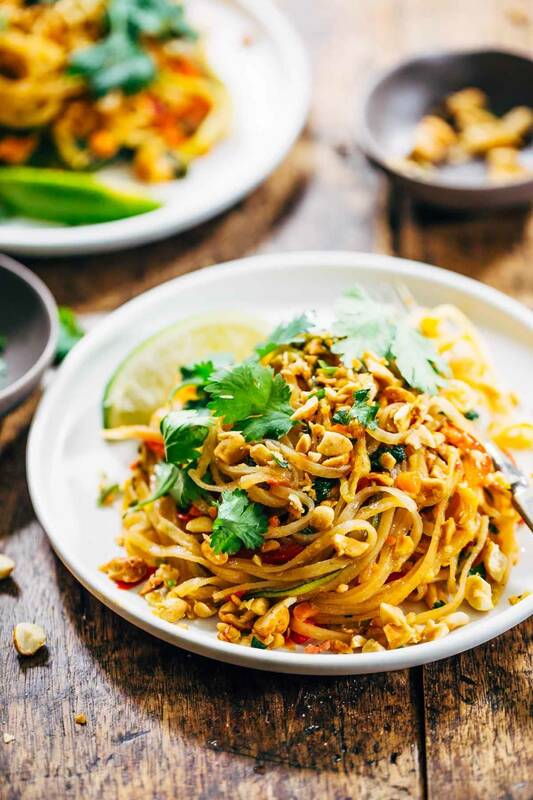 Let’s talk about how to make this Pad Thai, because it’s so easy. More like I’ll show you with pictures because I talk too much, always. One thing I should note real quick that the really fun thing about this recipe is spiralizing the veggies. You don’t need-need-need a spiralizer – you can use a peeler or just cut the veggies into thin strips – but man oh man, that thing is fun to use. 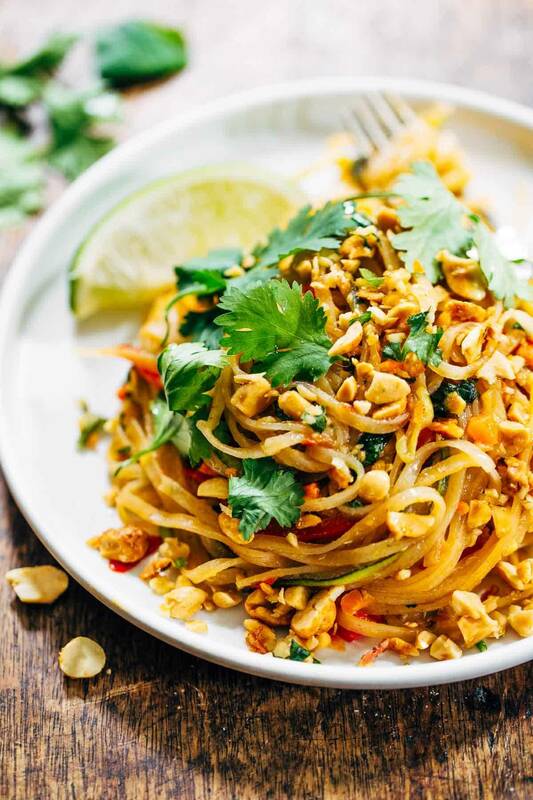 And with a swirl of the spiralizer, a shake of the sauce jar, and tong-toss of the noodles in the pan, you’ve got yourself one YUMMMMMY plate of Rainbow Vegetarian Pad Thai. Rainbow Vegetarian Pad Thai with a simple five ingredient Pad Thai sauce – adaptable to any veggies you have on hand! So easy and delicious! Spiralize the zucchini, red pepper, and onion into noodle-like shapes. Cut the carrots into very small pieces (or spiralize them, too, if they’re big enough). Heat a tablespoon of oil over medium high heat. Add the veggies – stir fry with tongs for 2-3 minutes or until tender-crisp (if they are not spiralized, they might need longer). Be careful not to overcook them – they’ll get soggy and heavy. Transfer to a dish and set aside. Add another tablespoon of oil to the pan. Drain the noodles – they should be softened by now. Add the noodles to the hot pan and stir fry for a minute, using tongs to toss. Add the sauce and stir fry for another minute or two, until the sauce is starting to thicken and stick to the noodles. Push the noodles aside to make a little room for the egg – pour the beaten egg into the pan and let it sit for 30 seconds or so. Toss everything around with the tongs. The egg mixture will stick to the noodles and everything will start getting sticky. If going sugar free is important to you, make sure to sub another sweetener for the brown sugar. Also important: fish sauce contains trace amounts of sugar. There is a fine line between the mixture being Just Right Sticky and TOO Sticky. Usually too sticky happens when you cook it too long. Watch it carefully and once you see it starting to come together, remove from heat right away and toss with the veggies. You might not need all the sauce in this recipe, but I (as a sauce lover) did use all of it! I would say just eyeball whatever amount looks good to you and save the rest to add in later if you want. This recipe is gluten free other than the 1 tablespoon soy sauce, so just swap that out for something else if you need it to be gluten free! NOTE: The fish sauce is a key ingredient and the flavor is hard to replicate, and personally, I’m not a die-hard vegetarian, so this works for me as is. But that being said, if I were an absolutely 100% vegetarian, I would try this recipe as a vegan fish sauce substitute. Note: this post contains affiliate links for the brown rice noodles! So flavorful! And looks amazing! Wow – does this look delicious or what! I definitely need to try this (even if it’s just so I can justify finally getting a spiraliser!). I wonder if the sauce would work with additional soy sauce instead of fish sauce?! Will have to try it out. I love Pad Thai but still haven’t found the time to find a good Thai restaurant in “town”. Welcome to my world! Now I’ve added pregnancy exhaustion to the running after three kids and we’ve been eating out WAY more than usual. I mostly refuse the frozen pizza and chicken nuggets because I also have an inner food snob who just doesn’t want to eat them. And I would totally make the kids eat the pad thai. Which, by the way, looks awesome! Pad Thai has totally been a pregnancy craving, maybe because I just want to eat things I can cover in sriracha. Your pad thai looks incredible. I love the fresh herbs and I totally agree, all food should be rainbow! This looks AMAZING! I actually work with Annie Chun’s and would love to discuss some sampling opportunities with you! Please send me an email at [email protected] if you’re interested! Thanks, Morgan! I’ll pass this along to Lindsay. 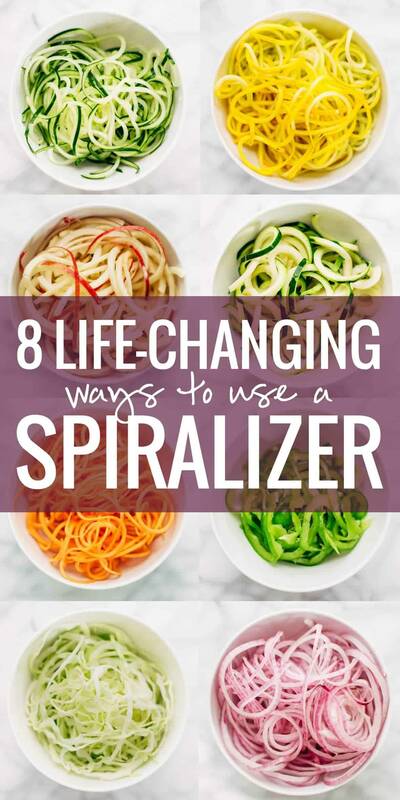 I have the same spiralizer and I had no idea you could spiralize red pepper! HOW is this possible? Chop off the top and stick the bottom into the spiky thing? and use the plain blade? Ha! That happens. 😉 Glad you enjoyed it! I’ll have Lindsay get back to you about the red peppers! GUURL!!! This looks like the bomb!! I mean, delicious!! I need to add zoodles to my diet. This looks amazing. I cannot get enough noodles in my life and these look absolutely perfect! Lindsay, your a girl after my own heart, this looks so good, my spirlalizer will definitely be trying this. Looks really good. Hang in there, It Gets Better, blah blah blah. When it comes to feeding your own kids and then eventually other kids under your stead in your own home – Feed them what you eat. From the beginning. My daughter is only now at age 11 becoming a picky eater because of the exposure via friends and at school to the crap that is the ‘Standard American Diet’. Don’t buy into it,!! I worked full time and still nursed for 2 years and made my own baby food (where was baby led weaning 11 years ago?!). I don’t do peanuts but this looks SO GOOD that I want it NOW ala Veruca Salt! Hi Lindsay! 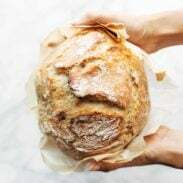 First recipe for me. Made this Monday night and it came out great!! Which is saying a lot since I really don’t cook or fail at cooking most times. I added chicken too sliced thin cooked quickly and added in at the end. Didn’t have a spiralizer used a grater for all the veggies. Looked like a lot of veggies but was perfect in the end and such a great way to get those in with noodles. Thanks for the great recipe hope to try another soon! Am always looking forward to your recipe ideas Linsay. This is just another one that i must try. And by the way, i was wondering what i should prepare for lunch today. Problem solved 🙂 Thank you for this one. Hope you enjoy it, Chella! Hi Lindsay, I’m so excited to try your recipe. But I’m wondering what’s the measurement if I’ll use vegan fish sauce as a substitute of fish sauce? Another astonishing series of posts. Dozens of posts by people who say “Ermigawd, looks great”, but only a handful who actually have tried it. Once again, I’ll post a real world review with constructive comments. First off, noodle cooking time. “Soak in cold water . . .” and then what? Asian noodles, be they made of brown rice or white rice, are little tricky to cook properly. They can go from too crunchy to overcooked in about 60 seconds. The standard method for pad Thai noodles is to put them in a large pot of hot tap water for 20 to 30 minutes. This slowly softens them about two thirds of the way through, and they finish cooking in the pan. On a more positive note, the sauce is pretty good. Definitely Americanized ingredients (e.g., no tamarind paste) , but still pretty good. It has the classic four Thai flavors of sweet, hot, sour and salty. However, it can be improved with the use of lime juice rather than white vinegar. I learned to cook this dish from a Thai friend, and she told me “Don’t get too hung up on the ingredients. 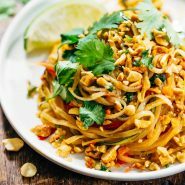 In Thailand, pad Thai is a quick dish to use up all of the extras that you have lying around your kitchen.” So, pretty much any veggies or meat will do. The key is to cook the noodles properly, and make the sauce correctly. So, for those of you reading those who are confused about the cooking time, go for 20 minutes or so and a large pot of HOT tap water, and that should do it. Thank you for the honest comment, John. Whenever I check recipe reviews, I do a search on the word “made” because of the nonsense comments. I have been hesitant making this sauce because it was did not include tamarind paste. I am going to try and try to do a follow up with my honest review. I love pad thai.. it’s one of my favorite meals and I love that there are so many variations of it. Thanks for this super healthy recipe. I’ve tried several of your recipes with good success. This one was not so good for me or my husband. Something odd-tasting with the sauce for it. The Brazilian bowl looks really good and I’m looking forward to trying it. Sorry to hear that, Jessica. Maybe cut back the amount of fish sauce a little bit to your liking? There were a few others who found the fish sauce too overpowering. Just made this for dinner and it was a success! I was nervous about the fish sauce and cooking the rice noodles, but it all worked out. I have a spiralizer (of some sort) but it failed to make noodles out of the pepper or onion. Oh well! I just adapted and it was still delicious. Thanks for the inspiration to try something new!